Lights on Women is committed to connecting with, training, supporting women in energy. Countless studies have found that gender balanced companies boost performance, effective decision making and bottom-lines. Despite the benefits, statistics show that women represent only 20% of the energy sector’s workforce at a world level. The ‘glass-ceiling’ seems quite hard to crack: women represent only 5% in executive boards of the 200 top energy companies. An inclusive energy transition will not happen on its own. The process must be managed, and we must actively set goals and meet them collaboratively. The Florence School of Regulation wishes to take steps towards meeting this goal by offering three scholarships to motivated early- or mid-career women to support their professional advancement with new or strengthened capabilities. FSR offers online training courses on a wide variety of key energy regulation and policy topics which will provide you with the technical knowledge needed to take advantage of employment and leadership opportunities. The flexibility provided by FSR’s online courses will allow selected candidates to follow the lessons at their own pace, so to balance learning with other professional and personal commitments. All FSR online courses adopt interactive tools, group projects and live activities to enhance the learning experience. You will have the chance to collaborate and network with global participants and a world-renowned faculty while gaining the knowledge and skills needed to boost your career. Browse our full online portfolio. 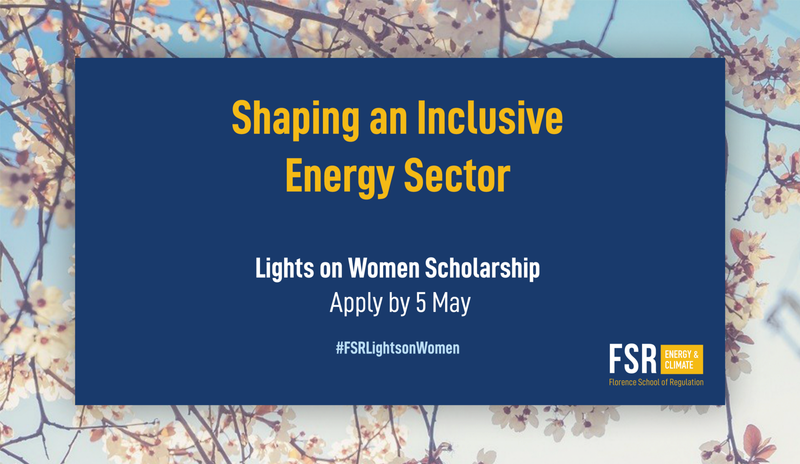 At the conclusion of the course, selected candidates will have the opportunity to produce an article that will be published on the FSR website and disseminated among the vast FSR Energy community. Note: please have all documents ready before starting the application form. Why the FSR online course of your choice could help your career. 3. A short biography and photo. This information will be used for communications purposes if the applicant is accepted for the scholarships. It should be written in third person singular and be around 100–120 words (around 800 characters with spaces). Documents should be submitted in English. Applications will be assessed by a Selection Committee of FSR members. The 3 successful candidates will be informed by the end of June 2019 and will be provided with all relevant information on how to enrol in the online course of their choice. *Kindly note that the FSR Annual training is a blended online-residential course and is not covered by the scholarship. Don’t forget to use our hashtag #LightsonWomen to spread the word!